This is a list of molecules that have been detected in the interstellar medium and circumstellar envelopes, grouped by the number of component atoms. The chemical formula is listed for each detected compound, along with any ionized form that has also been observed. The molecules listed below were detected by spectroscopy. Their spectral features are generated by transitions of component electrons between different energy levels, or by rotational or vibrational spectra. Detection usually occurs in radio, microwave, or infrared portions of the spectrum. Interstellar molecules are formed by chemical reactions within very sparse interstellar or circumstellar clouds of dust and gas. Usually this occurs when a molecule becomes ionized, often as the result of an interaction with a cosmic ray. This positively charged molecule then draws in a nearby reactant by electrostatic attraction of the neutral molecule's electrons. Molecules can also be generated by reactions between neutral atoms and molecules, although this process is generally slower. The dust plays a critical role of shielding the molecules from the ionizing effect of ultraviolet radiation emitted by stars. The chemistry of life may have begun shortly after the Big Bang, 13.8 billion years ago, during a habitable epoch when the Universe was only 10–17 million years old. Woon, David E. (October 1, 2010). "Interstellar and Circumstellar Molecules". Retrieved 2010-10-04. Dworkin, Jason P. (February 1, 2007). "Interstellar Molecules". NASA's Cosmic Ice Lab. Retrieved 2010-12-23. Wootten, Al (November 2005). "The 129 reported interstellar and circumstellar molecules". National Radio Astronomy Observatory. Retrieved 2007-02-13. Lovas, F. J.; Dragoset, R. A. (February 2004). "NIST Recommended Rest Frequencies for Observed Interstellar Molecular Microwave Transitions, 2002 Revision". National Institute of Standards and Technology. Retrieved 2007-02-13. ^ a b c d Battersby, S. (2004). "Space molecules point to organic origins". ^ a b Mulas, G.; Malloci, G.; Joblin, C.; Toublanc, D. (2006). "Estimated IR and phosphorescence emission fluxes for specific polycyclic aromatic hydrocarbons in the Red Rectangle". Astronomy and Astrophysics 446 (2): 537–549. ^ García-Hernández, D. A.; Manchado, A.; García-Lario, P.; Stanghellini, L.; Villaver, E.; Shaw, R. A.; Szczerba, R.; Perea-Calderón, J. V. (2010-10-28). "Formation Of Fullerenes In H-Containing Planatary Nebulae". ^ Atkinson, Nancy (2010-10-27). "Buckyballs Could Be Plentiful in the Universe". ^ a b c Chow, Denise (26 October 2011). "Discovery: Cosmic Dust Contains Organic Matter from Stars". ^ Kwok, Sun; Zhang, Yong (26 October 2011). "Mixed aromatic–aliphatic organic nanoparticles as carriers of unidentified infrared emission features". ^ Gallori, Enzo (November 2010). "Astrochemistry and the origin of genetic material". Rendiconti Lincei 22 (2): 113–118. ^ Martins, Zita (February 2011). "Organic Chemistry of Carbonaceous Meteorites". Elements 7 (1): 35–40. ^ Than, Ker (August 29, 2012). "Sugar Found In Space". National Geographic. Retrieved August 31, 2012. ^ Staff (August 29, 2012). "Sweet! Astronomers spot sugar molecule near star". ^ Jørgensen, J. K.; Favre, C.; Bisschop, S.; Bourke, T.; Dishoeck, E.; Schmalzl, M. (2012). 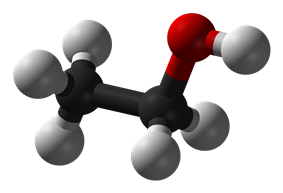 "Detection of the simplest sugar, glycolaldehyde, in a solar-type protostar with ALMA" (PDF). The Astrophysical Journal Letters. eprint 757: L4. ^ a b Staff (September 20, 2012). "NASA Cooks Up Icy Organics to Mimic Life's Origins". ^ a b Gudipati, Murthy S.; Yang, Rui (September 1, 2012). "In-Situ Probing Of Radiation-Induced Processing Of Organics In Astrophysical Ice Analogs—Novel Laser Desorption Laser Ionization Time-Of-Flight Mass Spectroscopic Studies". ^ Clavin, Whitney (10 February 2015). "Why Comets Are Like Deep Fried Ice Cream". ^ López-Puertas, Manuel (June 6, 2013). "PAH's in Titan's Upper Atmosphere". ^ Marlaire, Ruth (3 March 2015). "NASA Ames Reproduces the Building Blocks of Life in Laboratory". ^ Quenqua, Douglas (13 December 2013). "Noble Molecules Found in Space". ^ Khan, Amina. "Did two planets around nearby star collide? Toxic gas holds hints". ^ Dent, W.R.F. ; Wyatt, M.C. ;Roberge, A.; Augereau,J.-C.; Casassus, S.;Corder, S.; Greaves, J.S. ; de Gregorio-Monsalvo, I; Hales, A.; Jackson, A.P. ; Hughes, A. Meredith; Lagrange, A.-M; Matthews, B.; Wilner, D. (March 6, 2014). "Molecular Gas Clumps from the Destruction of Icy Bodies in the β Pictoris Debris Disk". ^ "Complex Organic Molecules Discovered in Infant Star System". NRAO (Astrobiology Web). 8 April 2015. Retrieved 2015-04-09. ^ Eyre, Michael (26 September 2014). "Complex organic molecule found in interstellar space". BBC News. Retrieved 2014-09-26. ^ Belloche, Arnaud; Garrod, Robin T.; Müller, Holger S. P.; Menten, Karl M. (26 September 2014). 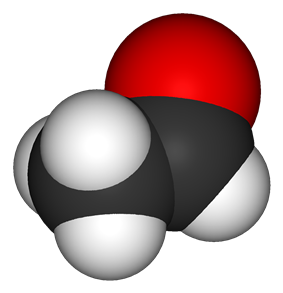 "Detection of a branched alkyl molecule in the interstellar medium: iso-propyl cyanide". Science 345 (6204): 1584–1587. ^ Iglesias-Groth, S.; et al. (2008-09-20), "Evidence for the Naphthalene Cation in a Region of the Interstellar Medium with Anomalous Microwave Emission", The Astrophysical Journal Letters 685: L55–L58, - This spectral assignment has not been independently confirmed, and is described by the authors as "tentative" (page L58). 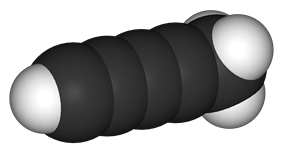 Evidence for the existence of the following molecules has been reported in scientific literature, but the detections are either described as tentative by the authors, or have been challenged by other researchers. They await independent confirmation. 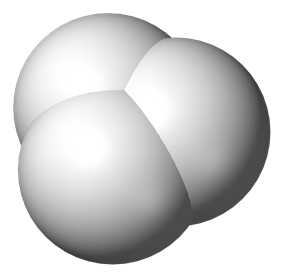 These molecules all contain one or more deuterium atoms, a heavier isotope of hydrogen. A number of polyyne-derived chemicals are among the heaviest molecules found in the interstellar medium. 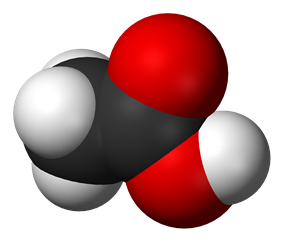 The radio signature of acetic acid, a compound found in vinegar, was confirmed in 1997. 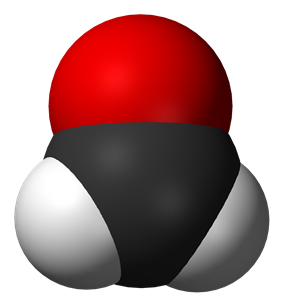 Acetaldehyde (above) and its isomers vinyl alcohol and ethylene oxide have all been detected in interstellar space. 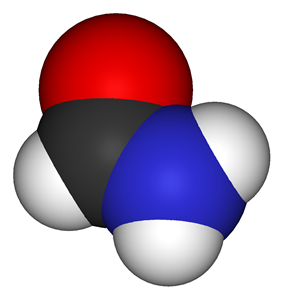 In the ISM, formamide (above) can combine with methylene to form acetamide. Methane, the primary component of natural gas, has also been detected on comets and in the atmosphere of several planets in the Solar System. The H3+ cation is one of the most abundant ions in the universe. It was first detected in 1993. 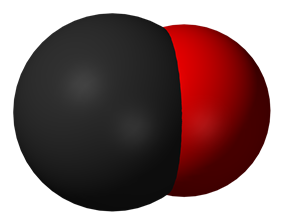 Carbon monoxide is frequently used to trace the distribution of mass in molecular clouds. The following tables list molecules that have been detected in the interstellar medium, grouped by the number of component atoms. If there is no entry in the Molecule column, only the ionized form has been detected. For molecules where no designation was given in the scientific literature, that field is left empty. Mass is given in Atomic mass units. The total number of unique species, including distinct ionization states, is listed in parentheses in each section header. In March 2015, NASA scientists reported that, for the first time, complex life, including uracil, cytosine and thymine, have been formed in the laboratory under outer space conditions, using starting chemicals, such as pyrimidine, found in meteorites. Pyrimidine, like polycyclic aromatic hydrocarbons (PAHs), the most carbon-rich chemical found in the Universe, may have been formed in red giants or in interstellar dust and gas clouds, according to the scientists. A particularly large and rich region for detecting interstellar molecules is Sagittarius B2 (Sgr B2). This giant molecular cloud lies near the center of the Milky Way galaxy and is a frequent target for new searches. About half of the molecules listed below were first found near Sgr B2, and nearly every other molecule has since been detected in this feature. A rich source of investigation for circumstellar molecules is the relatively nearby star CW Leonis (IRC +10216), where about 50 compounds have been identified. In 2013, Dwayne Heard at the University of Leeds suggested that quantum mechanical tunneling could explain a reaction his group observed taking place, at a significantly higher than expected rate, between cold (around 63 Kelvin) hydroxyl and methanol molecules, apparently bypassing intramolecular energy barriers which would have to be overcome by thermal energy or ionization events for the same rate to exist at warmer temperatures. The proposed tunneling mechanism may help explain the common observation of fairly complex molecules (up to tens of atoms) in interstellar space. PAHs are found everywhere in deep space and, in June 2013, PAHs were detected in the upper atmosphere of Titan, the largest moon of the planet Saturn. In September 2012, amino acids and nucleotides, the raw materials of proteins and DNA, respectively". Further, as a result of these transformations, the PAHs lose their spectroscopic signature which could be one of the reasons "for the lack of PAH detection in interstellar ice grains, particularly the outer regions of cold, dense clouds or the upper molecular layers of protoplanetary disks." In 2010, fullerenes (or "buckyballs") were detected in nebulae. 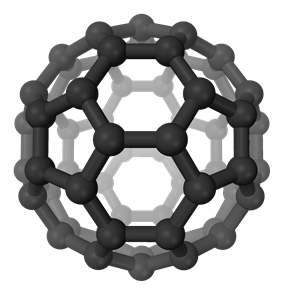 Fullerenes have been implicated in the origin of life; according to astronomer Letizia Stanghellini, "It's possible that buckyballs from outer space provided seeds for life on Earth." In 2004, scientists reported detecting the spectral signatures of anthracene and pyrene in the ultraviolet light emitted by the Red Rectangle nebula (no other such complex molecules had ever been found before in outer space). This discovery was considered a confirmation of a hypothesis that as nebulae of the same type as the Red Rectangle approach the ends of their lives, convection currents cause carbon and hydrogen in the nebulae's core to get caught in stellar winds, and radiate outward. As they cool, the atoms supposedly bond to each other in various ways and eventually form particles of a million or more atoms. The scientists inferred that since they discovered polycyclic aromatic hydrocarbons (PAHs) — which may have been vital in the formation of early life on Earth — in a nebula, by necessity they must originate in nebulae.